My mom and Kim a good friend from college gave me a shower yesterday. I was so fun and it went well. 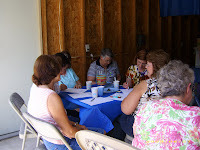 We had some finger foods and played some games. 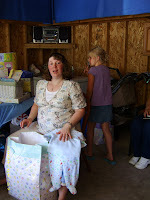 The games where Guess how big Jen belly is measuring, Guess the Nursery Rhymes, and baby Bingo. 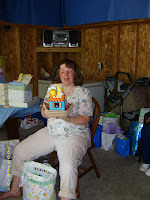 I had fun and Noah got some clothes for 6 mos and up, a few smaller sizes, toys, some pictures frames. 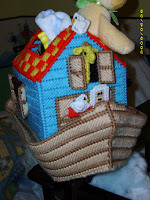 One of aunts (Johnna) Made this for Noah out of Needle point. 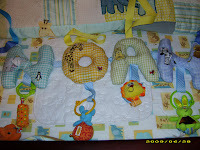 Another one of my aunts (Joyce) made this for Noah to play with in his crib. It attachs to the side of it. 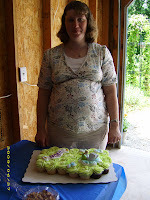 The cake is made out of cupcakes. o wow the shower looked beautiful!! 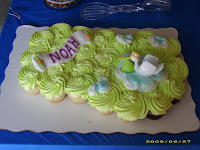 You must be getting so excited about Noah's arrival! You look great! Looks like fun! You have an award on my blog! Look at that adorable belly! 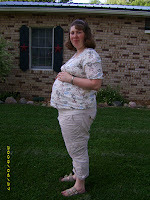 You are growing! 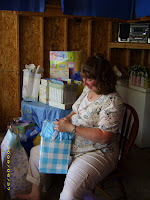 I love all the fun stuff from the shower - this baby is so loved already!